During its GDC 2017 livestream event, Nvidia kicked things off with an entirely expected bomb of news: you can now have the firm’s second-best-ever graphics card, the GTX 1080, for around $200 off the original asking price. Those that have been lustfully watching that unwavering price tag for months will know that this means the GTX 1080 from Nvidia will now cost $499 in the US, not around $699 where it sits now. 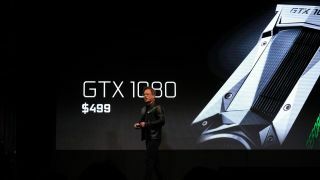 Nvidia CEO Jen-Hsun Huang did not divulge on stage, however, how and when this price cut would effect pricing in the UK and Australia. Naturally, the price cut was made to make way for the forthcoming GTX 1080 Ti, which will serve as Nvidia’s absolute highest end graphics card for the time being. But, you get to reap the benefit of nabbing a seriously future-ready part for a bit less than before. Checking the Nvidia GeForce site during its livestream, the price cut has yet to officially take effect as of this writing. We’ll keep this space up to date, so that you know when it’s time to save.